These are links users have found to be helpful for Mage. Pyromancers are destructive mages whose sole focus is the mastery of fire, from launching massive incinerating blasts, to trapping their opponents behind a smoldering wall of flame. No other Ascended can match the sheer destruction at the Pyromancer's fingertips. Stormcallers are mages who channel the raw fury of wind and water to command the battlefield, chilling their opponents to the bone or stopping their hearts with electric shock. The Chloromancer is a healing specialist who draws on the vital energies of plants and nature to find a balance between life and death. They harness these energies into a devastating force, or recycle destructive magic to heal their allies. Necromancers are damage dealers who synergize with their pets. The majority of a Necromancer's damage comes from a fully supported and buffed pet. In an emergency, Necromancers can also serve as secondary healers by sacrificing their own health to their allies. 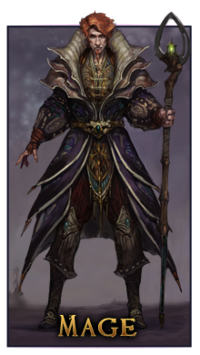 Archons are support specialists who steal their opponents' strength and convert that raw energy into beneficial magic. These mages bolster their allies and unleash potent kinetic blasts, quickly turning the tide of battle. The Dominator is a support Mage who terrorizes opponents, leaving them unable or unwilling to act. Those who muster the courage to assault a Dominator will find themselves at the mercy of arcane shields that turn the fury of their own blows against them. The Harbinger adds fearsome melee prowess to the Mage Calling, wielding blades of conjured Air and Life energy. This grim weaponmaster spells doom for enemies in close combat, and can work in tandem with other Souls to reduce cast times, providing deadly barrages from any range. The Harbinger uses unarmored mobility and future-sight to survive in the thick of battle, invoking absorption, self-healing, and avoidance abilities – including invisibility – to mitigate damage and set up devastating attacks. Devastating long-range combatants, the arcane powers which Mages wield can tear through any opponent, regardless of armor. While Mages are renowned as a fearsome offensive force on the field of battle, a number of orders specialize in potent support and healing magic as well. Some Mage souls make use of charges that are added by some spells and consumed by others. Some simply increase the effect of other spells. These charges are indicated by hexagonal icons directly below your target's health and mana bars. The art of weaving magic does not favor heavy armors that distract the senses and restrict movement. Though the Mage's traditional light cloth robes leave their bodies vulnerable, their mind is their true bulwark. Mages employ a variety of arcane items such as staves, wands, tomes, and totems to focus their spell-casting. In addition, many Mages protect themselves in close combat with a simple edged weapon such as a dagger or short sword. (Raid T1) Tormentor's Robe Outfitter (2): Increases Endurance by 20. (3): Increases Spell Power by 20. (4): Grants a chance for your damaging Abilities to deal an additional 150 to 220 Fire damage. This page last modified 2013-02-19 13:30:45.